PokerTracker 4 imports text hand histories that are saved to your computer by the Full Tilt Poker client. Once imported, these hands are stored within PostgreSQL and made available for review and analysis in your PT4 database. This process must be correctly configured so that PokerTracker 4 can retrieve these hand histories and also display the Heads Up Display (HUD) on your Full Tilt Poker table(s) correctly. Please note that from early 2016 Full Tilt is a skin of PokerStars, and needs to be configured as PokerStars in PokerTracker 4. Please follow the PokerStars Configuration Guide if you play at Full Tilt. This guide is intended for users who wish to manually configure PokerTracker 4 to important hand histories from Full Tilt Poker, alternatively you may choose to use the automated Setup Assistant. Both options (manual configuration and the Setup Assistant) are simple, but users may prefer using the Setup Assistant for initial configuration. For general information on the initial setup of PokerTracker 4, please consult the PokerTracker 4 Quick Start Guide. 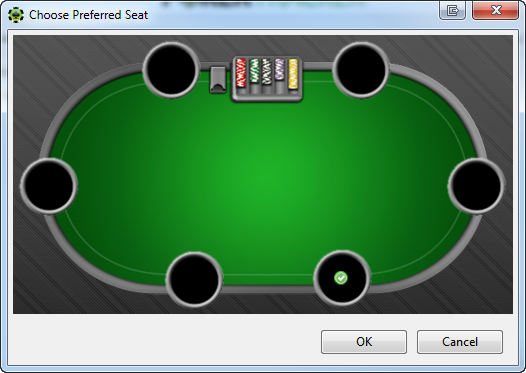 There are a couple steps for configuring Full Tilt Poker using the Setup Assistant. Step 1: If you haven't already, please make sure that Full Tilt Poker is configured to save hand histories to your hard drive. Step 2: You must tell PokerTracker 4 where Full Tilt Poker saves its hand histories. You can use the Auto Detect option to let PokerTracker 4 automatically find where the hand histories are being written. This can be also done manually by going to “Add” and pointing PT4 to the Full Tilt Poker Hand History Folder on your computer. We recommend you also add the Full Tilt Poker Tournament Summary folder at the same time to assure that accurate results will be available in the event you play any Full Tilt Poker tournaments. Once this is configured correctly, click Next. Step 3: To assure proper HUD placement, you must also configure your seating preferences in PokerTracker 4 to match your seating preferences on Full Tilt Poker. A preferred seat is the seat location you automatically sit at when you sit down at a table. PokerTracker 4 must know your preferred seat to ensure that the HUD correctly displays while you are playing. If you have a preferred seat on Full Tilt, make sure the button says “Yes”. (If you do not, please turn this option to “No” and push Next) . Click Change next to each table type and select the seat in the graphical interface where you automatically sit at while playing. If you are automatically seated in the center seat change the Full Tilt Auto-Center to Yes, this will override your other preferred seat settings. Tip: If you have a lot of hand histories saved in your Full Tilt Poker folder, the import process may take some time. Please be patient and let PokerTracker 4 import all of your hands for optimal results. You must configure the Full Tilt client to save hand histories to a designated directory on your hard drive. This is important so that PokerTracker 4 may grab hand histories for the database. Check Save My Hand Histories. Make sure that the Hand History Language Selection is in English. If English is not selected then please change it to English as PokerTracker 4 currently only supports the English language. The Full Tilt client must be configured to be in the English language. PokerTracker 4 currently only supports English and if the Full Tilt client is in another language it will cause problems. Choose English in both the Game Software Language Selection and Cashier & Email Language Selection columns. Click OK to save the language options. Please make sure that your hand histories are also saved in English. Tip! If you restart the Full Tilt client after making your changes PokerTracker can automatically read these settings and detect which table type you are using the next time it starts up, so there is no need to configure preferred seating manually in PokerTracker 4. Users that play Rush tables may need to manually configure PokerTracker 4. Rush is not enabled by default, nor is it available in the Setup Assistant. To manually configure Rush click Configure -> Site & Import Options from the main menu and select Full Tilt. Make sure that the option Enable Rush HUD is checked if you are playing Rush and use a HUD. Click OK to save your settings. With PokerTracker 4 configured correctly, you simply need to follow these steps to ensure your HUD is operational on Rush tables. These steps must be followed exactly, otherwise your HUD will not work. The default seat for players who do not have preferred seating enabled at Rush tables is seat 3 for 6 max or seat 5 for 9 max tables. For optimal results, please allow the importer to import any existing hand histories before playing Rush tables to minimize the time it takes the HUD to begin working. As always, make sure that neither Full Tilt nor PokerTracker 4 are open before updating the PT4 application. To be safe, it can be helpful to reboot your system before updating. Some personal Firewalls may conflict with the Rush HUD from operating, please see the Firewall Troubleshooting Guide for more information. At the time that this guide was written the Comodo Firewall is not compatible, we recommend you replace Comodo with a different firewall option if you intend to play on Full Tilt Rush tables. You must use the default layout when playing on Rush tables. Modified Full Tilt table layouts are not supported when playing at Rush tables within PokerTracker 4. PokerTracker 4 cannot import Full Tilt Poker hand histories or display the Heads Up Display (HUD) in real-time while playing without prior configuration. You can easily do this by clicking Configure in the application menu, and then select Site & Import Options. View the Site Configuration tab and choose Full Tilt along the left side Poker Network list. Make sure Get Hands From Site While Playing is selected, or if you do not play on Full Tilt Poker then you can select Hide Site From Lists to hide it from view. Next, click Auto Detect to populate the path of the Full Tilt Poker Hand History Directories. Finally set up your preferred seating if applicable, and choose to enable the Rush HUD if you play on this type of table. Note: The Rush HUD is not available in the Mac OS X version of PokerTracker 4 due to compatability issues.